Not long ago, I spent the morning having coffee with Kanzi. It wasn't my idea; Kanzi invited me, though he did so in his customary clipped way. Kanzi is a fellow of few words  384 of them by formal count, though he probably knows dozens more. He has a perfectly serviceable voice  very clear, very expressive and very, very loud. But it's not especially good for forming words, which is the way of things when you're a bonobo, the close and more peaceable cousin of the chimpanzee. But Kanzi is talkative all the same. For much of his day, he keeps a sort of glossary close at hand  three laminated, place mat  like sheets filled with hundreds of colorful symbols that represent all the words he's been taught by his minders or picked up on his own. He can build thoughts and sentences, even conjugate, all by pointing. The sheets include not just easy nouns and verbs like ball and Jell-O and run and tickle but also concept words like from and later and grammatical elements like the -ing and -ed endings signifying tense. Kanzi knows the value of breaking the ice before getting down to business. So he points to the coffee icon on his glossary and then points to me. He then sweeps his arm wider, taking in primatologist Sue Savage-Rumbaugh, an investigator at the Great Ape Trust  the research center in Des Moines, Iowa, that Kanzi calls home  and lab supervisor Tyler Romine. Romine fetches four coffees  hot, but not too hot  takes one to Kanzi in his patio enclosure on the other side of a Plexiglas window and then rejoins us. Kanzi sips  gulps, actually  and since our voices are picked up by microphones, he listens as we talk. "We told him that a visitor was coming," Savage-Rumbaugh tells me. "He's been excited, but he was stubborn this morning, and we couldn't get him to come out to the yard. So we had to negotiate a piece of honeydew melon in exchange." Honeydew is not yet on Kanzi's word list; instead, he points to the glyphs for green, yellow and watermelon. When he tried kale, he named it "slow lettuce" because it takes longer to chew than regular lettuce. The not-for-profit Great Ape Trust is home to seven bonobos, including Kanzi's baby son Teco, born this year on June 1. 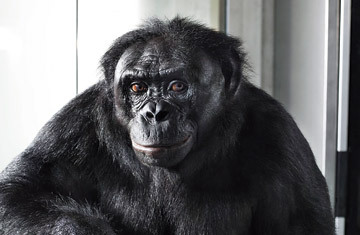 Kanzi is by no means the first ape to have been taught language. The famous Koko, Washoe and others came before him. But the Trust takes a novel approach, raising apes from birth with spoken and symbolic language as a constant feature of their days. Just as human mothers take babies on walks and chatter to them about what they see even though the child does yet not understand, so too do the scientists at the Trust narrate the lives of their bonobos. With the help of such total immersion, the apes are learning to communicate better, faster and with greater complexity. All the same, today Kanzi is not interested in saying much, preferring to run and leap and display his physical prowess instead. "Ball," he taps on one of his glossary sheets when he finishes his coffee. "Tell him you'll get it for him," Savage-Rumbaugh instructs me and then shows me where the necessary symbols are on a sheet I have in hand. "Yes-I-will-chase-the-ball-for-you," I slowly peck out, chase being a word Kanzi uses interchangeably with get. It takes me a while to find the ball in an office down the hall, and when I finally return, Savage-Rumbaugh verbally asks Kanzi, "Are you ready to play?" He looks at us balefully. "Past ready," he pecks. Our dodge  a not unreasonable one  has always been that animals are ours to do with as we please simply because they don't suffer the way we do. They don't think, not in any meaningful way. They don't worry. They have no sense of the future or their own mortality. They may pair-bond, but they don't love. For all we know, they may not even be conscious. "The reason animals do not speak as we do is not that they lack the organs," René Descartes once said, "but that they have no thoughts." For many people, the Bible offers the most powerful argument of all. Human beings were granted "dominion over the beasts of the field," and there the discussion can more or less stop.